I think most of us would agree that cupcakes are what Martha would call "a good thing." 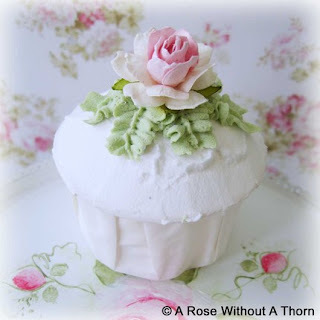 Etsy's A Rose Without a Thorn specializes in beautiful faux cupcakes with intricate detailing and gorgeous shabby chic accents. I would put on of these on a pretty bone china plate over some vintage fabric or Brattenberg lace and use it as a decorative accent. These individual decorative cupcakes sell for $8.50 each and will last for years, unlike most cupcakes...and if you know of an edible cupcake that actually has managed to last for years--well, you should know my feelings on some of the artificial preservatives on the market by now. This would be a great gift for a cupcake fan! What about making up a cupcake-themed gift basket of bath and body for your sister or friend? You could get a pretty white wicker basket, add some pretty fabric and fill it with cupcake themed goodies. Why not put in a cupcake from Bangerang Bake Shop or Glutenada, some Jojoelle perfume in Lavender Cupcakes. 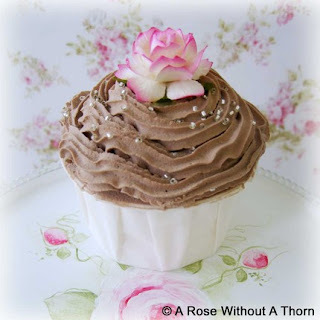 You can add finish it off by adding in a Pink Buttercream Cupcake candle from Pink Rose Pastries. What a great gift for the cupcake lover! If you can only pick one of these, however, why not go for the $8.50 gift that'll last for years to come?